Friday January 16- 1931 l did some cleaning this forenoon. Hattie came and was here till two oclock. I worked on my coat lining. There was quite an account in todays Chicago paper about the earth-quake in Mexico City I was down stairs in evening listening to The Radio Saturday January 17- 1931 I slept late. Had letter from Laura. Wrote to her and C. Coddington. After dinner to Lizzie Felkner I read awhile and went to The Library for more books. 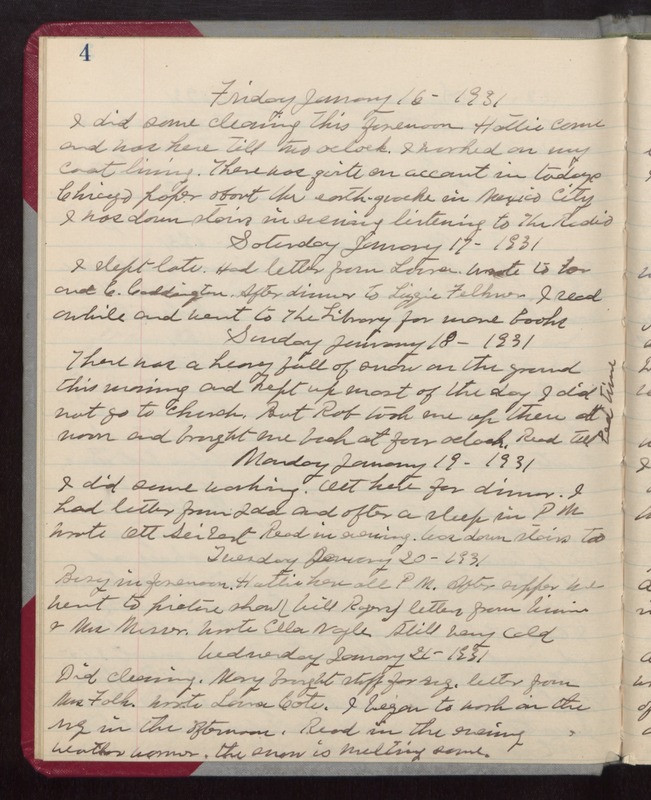 Sunday January 18- 1931 There was a heavy fall of snow on the ground this morning and kept up most of the day I did not go to church. But Rob took me up there at noon and brought me back at four oclock. Read till bed time. Monday January 19- 1931 I did some washing. Ott here for dinner. I had letter from Ida and after a sleep in PM wrote Ott Seibert Read in evening. Was down stairs too Tuesday January 20- 1931 Busy in forenoon. Hattie here all PM. After supper we went to picture show (Will Rogers) letters from Winnie & Mrs Messer. Wrote Ella Nagle. Still very cold Wednesday January 21- 1931 Did cleaning. Mary brought stuff for rug. letter from Mrs Falk. Wrote Laura Cote. I began to work on the rug in the afternoon. Read in the evening Weather warmer. the snow is melting some.